Proudly serving Sonoma, Mendocino & Lake County. 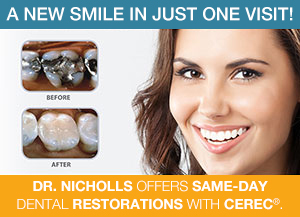 Welcome to the homepage of Cloverdale dentist, Richard Nicholls, DDS. Dr. Nicholls has the skills needed to provide a wide variety of procedures such as preventative care, restorative, and cosmetic dentistry. If you are searching for dental services within Cloverdale, California, there is no better choice than Dr. Nicholls. He will carefully analyze your situation to find the procedure that best fits your needs. We are excited about the opportunity to serve you, so call our office today at 707-894-3986 to schedule a consultation. For additional information please browse through our educational dental blog. We’re frequently posting news, updates and new articles along with occasional special offers. What others have to say about our practice. I needed immediate care for the extraction of a broken molar. Dr. Nicholls & staff made an unpleasant process as pleasurable as could be. The entire procedure was handled the same day as the original appointment. Excellent Dentist! Marquis V.
Dr. Nicholls is an excellent dentist! He identified a problem with a tooth that my former fancy-schmancy San Francisco dentist had overlooked. His equipment is modern and he uses the latest dental techniques. I’ve been a patient for over a year and am very happy with the work that he has done. I highly recommend him. Marilyn M.
Same-day restorations in Cloverdale, California. CEREC® (Chairside Economical Restoration of Esthetic Ceramics, or CEramic REConstruction) allows Dr. Richard Nicholls to create dental restorations using computer-aided technologies, including 3D photography and CAD/CAM. The CEREC® system can be used for inlays and onlays, crowns, bridges and veneers, and done in just one visit to our office. And yes, in most instances we can replace those unsightly metal “amalgam/silver” fillings with CEREC® ceramic—with the same characteristics of healthy dental enamel. Contact your local Cloverdale dentist. ©2018 Richard Nicholls, DDS. Powered by Deploy Dental.